Surrounded by carving tools, brushes and bowls of pigment, he spends hours absorbed in the exacting work that has become both a passion and a ten-year project. A Canadian who moved to Tokyo in 1986, David Bull has made an extensive effort to learn and practice woodblock printmaking as it was mastered in Edo-era Japan. He is currently producing a series of woodblock prints using designs by the famous Ukiyo-e artist Katsukawa Shunsho. The theme is the 100 poets of old Japan (Hyakunin Isshu) and in four years he has completed 40 of them. He expects to finish the collection in 1998. A relative newcomer to woodblock printmaking, Bull works from an unusual perspective. He is able to look objectively at his craft - its significant history and less promising future. He is honest about his own skills, at ease with his work, and in some ways very businesslike. Yet he can't help being affected by the romance of the woodblock print, which he describes as soft, quiet and beautiful. This has led to some exceptional work. In blue jeans and wrinkled shirt, his feet bare, Bull looks the part of the disheveled artist. But he is quick to challenge this association. "The biggest misunderstanding people have about me is thinking I am an artist," says Bull. "I'm not an artist. I do not create my designs. "Modern artists think of their work as being much more vivid or active," he says. "They use the woodblock print as a form of artistic expression to introduce a range of subjects and styles. Emotion plays a more important role. It's a different kind of thing. I am simply a craftsman working toward a higher level in my craft." At the same time, Bull says he works from a different perspective than the 40 or so members of the Tokyo Association of Woodblock Printmaking Craftsmen, who are also committed to the old style of printmaking. As dictated by tradition, woodblock carving and printing are handled by separate craftsmen, each painstakingly trained in his own discipline. David Bull is the only member of the group doing both. "My whole thinking is very different," says Bull. "My motivation and training are different. Many of these people are just doing their jobs, but my whole life is wrapped up in this. I can't help but love it." That doesn't mean he can't see clearly what is happening to his style of printmaking. For years it has been declining, always in the shadow of Edo-era Japan. According to Bull, the talent of artisans working 200 to 300 years ago has gone unmatched in recent times. And though he regrets this, he accepts it as natural and inevitable. "When the number of people doing any one thing decreases, the level of achievement drops," he says. "Once there were hundreds of craftsmen making woodblock prints - some were superb, some weren't so good, and most were in the middle. With fewer craftsmen you cannot have that range of ability. It's a natural consequence of the small number of people practicing these techniques. "In that sense, I feel good about what I'm doing - that I'm helping to maintain it a little longer. It gives me a warm and good feeling about myself. But I also am rational about it and recognize that it's disappearing." Bull is also upfront about his own ability. While he has accomplished a great deal in a short time he feels he still has much to learn. "There's an amazing amount of space left for growth," he says. "If you look as what has been done, and what I am doing now, I still have a long way to go." Which is part of the reason he stays with it. The personal challenge is a stimulus that keeps him long hours in his tatami mat workshop. Each print, each poet, becomes a new chance to test his skill level and craftsmanship. 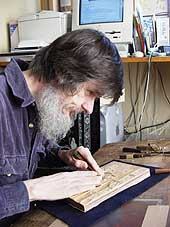 David Bull began his woodblock printmaking in the early 1980's, while still living in Canada. 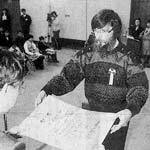 By 1986 he was ready to make a serious commitment so he and his family moved to Japan. English teaching provided an income while he learned more about woodblock printmaking from a number of experts, and his skills quickly improved. It was not until 1988, however, that he made his first print from the Hyakunin Isshu and began to consider turning his hobby into a livelihood. His theme was chosen almost by chance. Based on a famous collection of poems written between the seventh and thirteenth centuries, it is part of Japanese literary culture and of significant interest to the people of Japan. Many Japanese recognize the poems from a popular card game played with two sets of 100 small cards. One set contains the complete poems and is seen only by the reader, who chants each poem while the other players scramble to locate a matching card. While David Bull's prints are based on the same theme as the card game, they are actually reproduced from an old book containing illustrations of the poets with calligraphic renderings of their poems. The book was designed by Ukiyo-e artist Katsukawa Shunsho and published in Edo in 1775. At that time that card game had become popular and the book was perhaps intended for young ladies studying poetry. David Bull uncovered this book at an opportune time. "It was a question of a number of things coming together at once," he says. "My skill had come to the point where it was at a professional level - and I stumbled onto this subject. But taking on a ten-year project - that's a big ambition. I remember well my mood," he says, waving hair from his eyes. I had to ask myself a lot of serious questions." 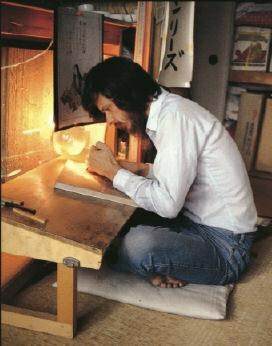 As he became more andmore committed to the project, Bull made contact with a number of Japanese craftsmen who offered not only advice but encouragement. They supplied him with materials such as cherry woodblocks, washi, blades for his carving tools, bamboo skins to cover his printing baren (rubbing pad), and materials for storing and shipping the finished prints. These men were extremely important to the new venture, and Bull still counts them among his strongest supporters. With their help he was able to move onto a second print of poetess Ono No Komachi. Today Bull completes 10 woodblock prints each year, though he does not follow the traditional sequence for the Hyakunin Isshu. Instead he has split the 100 poets into 10 balanced sets that include poetesses, ministers and priests. He does not sell the prints individually, but offers yearly subscriptions. And that means more carving and printing, more pride at being part of a 300-year-old tradition, and 62 more outstanding prints.